The updated schedule announced Wednesday also calls for a pad abort test next spring in New Mexico to test the spaceship’s ability to escape a catastrophic launch vehicle failure and save its crew. Boeing has a $4.2 billion contract with NASA to develop the reusable crew capsule, which will launch aboard United Launch Alliance Atlas 5 rockets from Cape Canaveral, dock with the International Space Station for stays of up seven months, and return to Earth for landings in the Western United States with the aid of parachutes and airbags. NASA has also partnered with SpaceX, which is developing the Crew Dragon spacecraft for launch on the company’s own Falcon 9 rockets. The two commercial crew contractors will end NASA’s sole reliance on Russian Soyuz vehicles to ferry astronauts to and from the space station. John Mulholland, Boeing’s vice president and program manager for the CST-100 Starliner program, told reporters Monday that the propellant leak on a test stand at NASA’s White Sands Test Facility in New Mexico was caused by several faulty valves inside the abort propulsion system on a service module testbed. The test anomaly, first reported last week by Ars Technica, occurred as engineers test-fired four abort engines at the base of the service module. The CST-100 Starliner spacecraft will fly with a reusable crew module, which comes back to Earth with passengers on-board, and a disposable service module housing the ship’s primary propulsion system, solar panels and radiators. 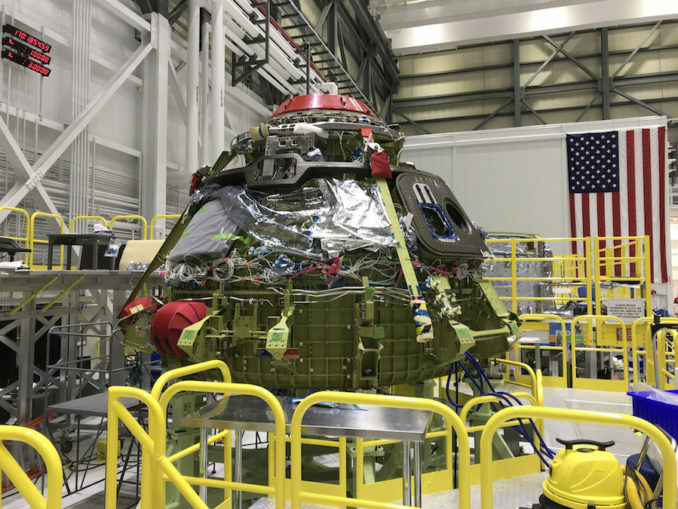 Boeing built a flight-like service module for hotfire testing at White Sands, before managers planned the CST-100 Starliner’s pad abort test this summer. The four launch abort engines are joined by 48 smaller thrusters on the CST-100 service module, including a set of 1,500-pound-thrust orbital maneuvering and attitude control engines used for pointing during a launch abort and for large orbital maneuvers, and pods of 100-pound reaction control thrusters, all manufactured by Aerojet Rocketdyne. According to a report published by Aviation Week and Space Technology, four of eight valves regulating the flow of propellants into the launch abort engines were stuck open after the shutdown command. “The result of that was leakage of hypergolic propellant, which was contained at the test site, and there was no damage to the test article, and no personnel injuries,” Mulholland said. The service module’s rocket engines consume a hypergolic mixture of hydrazine and nitrogen tetroxide propellants, which combust upon contact with one another. During a real launch escape, the CST-100’s launch abort engines would fire for around 4.5 seconds, guzzling huge quantities of propellant to push the capsule away from a failing booster. The high-pressure flow of propellant into the abort engines requires the use of dedicated valves, Mulholland told Spaceflight Now in an interview last year. Each engine includes a fuel and oxidizer valve. Mulholland said Wednesday that managers launched a joint investigation involving NASA and industry engineers to probe the June 2 test anomaly. “We are confident that we identified the root cause and are implementing correcting actions now,” he said, without elaborating on the investigation’s findings. “Our team is off fixing those problems, and the result of that test series is that we will have a better and safer spacecraft,” Mulholland said. The propulsion problem caused Boeing to reschedule the pad abort test, during which a CST-100 spacecraft will fire off a launch mount at White Sands to simulate an escape from a launch pad emergency, from this summer to next spring, Mulholland said. The updated schedule outlined by Mulholland on Wednesday calls for the uncrewed test flight to launch on an Atlas 5 rocket at the end of this year or in early 2019 from Cape Canaveral. The CST-100 capsule will make an automated docking to the space station for a short stay, then return to Earth. After the pad abort test in New Mexico, the crew flight test will be readied for takeoff in mid-2019 on another Atlas 5 flight from Florida’s Space Coast, likely with two or three crew members on-board. Boeing test pilot Chris Ferguson, who commanded the last space shuttle mission in 2011 before retiring from NASA, will helm the crew test flight. One or two NASA astronauts will accompany Ferguson, and their identities will be revealed in a ceremony Friday at the Johnson Space Center in Houston. The space agency plans to announce Friday which astronauts will ride on the initial Boeing and SpaceX crew missions. NASA and Boeing have agreed to potentially use the CST-100 Starliner’s crewed test flight, which originally was supposed to launch with a Boeing test pilot and a NASA astronaut, to carry a passenger who would stay aboard the space station for a long-duration months-long stay. If NASA chooses to exercise that option, the extra crew member could help ensure the station has a U.S. astronaut on-board after the space agency’s agreement with the Russian government for Soyuz crew seats expires. These measures are aimed at reducing the risk of a gap in U.S. crew access to the space station, a focus of a Government Accountability Office report released last month. 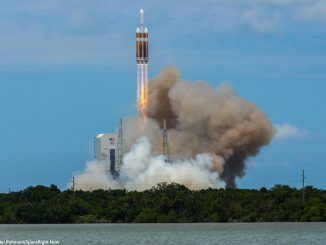 The GAO said a NASA schedule analysis suggested Boeing and SpaceX may not be certified for regular crew rotation missions to the station — a milestone achieved after CST-100 and Crew Dragon crew flight tests — until late 2019 or early 2020, and perhaps months later in a worst-case scenario. 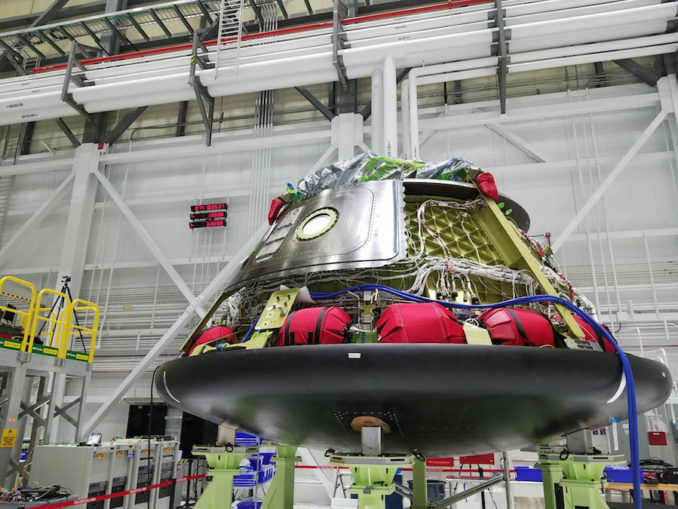 Boeing is building three flight-worthy CST-100 crew modules at its manufacturing site at the Kennedy Space Center in Florida, housed in a former space shuttle processing hangar. Spacecraft 1, the first of the line, will be used on the pad abort test in New Mexico. 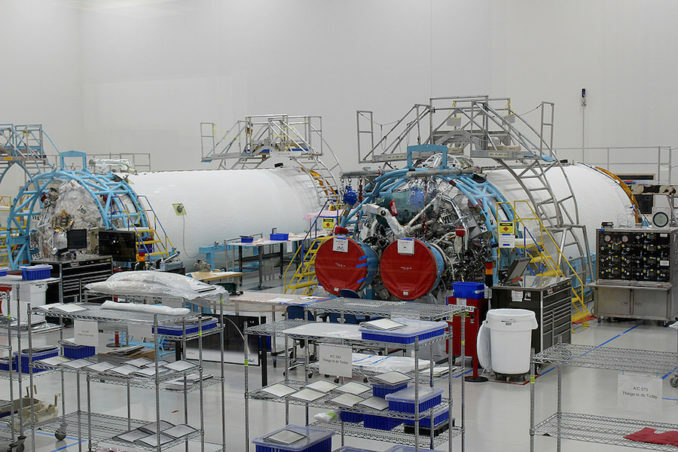 Spacecraft 2, which is nearing completion, will soon be shipped cross-country to Boeing’s test site in El Segundo, California, for a battery of tests to subject it to the extreme temperatures, vacuum conditions and acoustic environment it will encounter in flight. Spacecraft 2 will return to Florida for the crew flight test, while Spacecraft 3 is scheduled to be completed at KSC later this year, when it will immediately proceed into launch preparations for the uncrewed orbital test flight. According to Mulholland, the Atlas 5 rocket assigned to the CST-100’s uncrewed test flight — known by the tail number AV-080 — is complete and ready for transport from ULA’s factory in Decatur, Alabama, to Cape Canaveral. 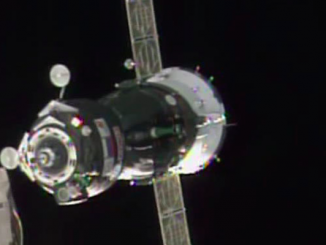 The launcher for the crew flight test is “very close to completing also,” he said. The Atlas 5 rocket configuration which will launch CST-100 crews will fly with two strap-on solid rocket boosters and a Centaur upper stage powered by two RL10 engines, not the single-engine Centaur stages flown on all Atlas 5 missions to date. ULA has finished around 90 percent of the qualification required to human-rate the Atlas 5, Mulholland said. Boeing’s previous target dates for the uncrewed and crew flight tests called for launches in August and November, respectively. Any realistic expectation to achieve that schedule had eroded months ago. The schedule for SpaceX’s Crew Dragon test flights is also expected to be delayed, but the company has not announced a new timeframe for the demo missions. In a July 26 meeting, members of NASA’s Aerospace Safety Advisory Panel said technical concerns with both Boeing and SpaceX, and a series of certification reviews required by NASA, continue to create uncertainty in the commercial crew program’s schedule. “We’re reaching the point where the program is rapidly approaching the launch of those demos,” said Sandy Magnus, an ASAP member and former astronaut. “The momentum of activities is going to continue to build, but there’s a lot left to accomplish. George Nield, a veteran aerospace engineer and former head of the Federal Aviation Administration’s commercial space office, said NASA and contractor officials are on the lookout for the burdens of schedule pressure. 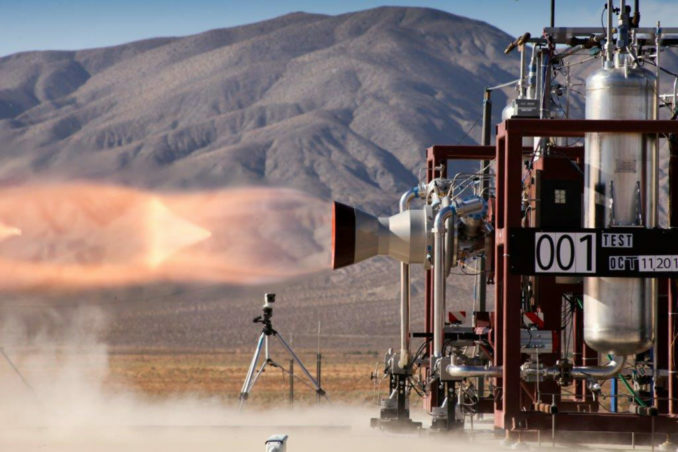 Nield said the safety panel should “expect some uncertainty in the near-term schedule, particularly for the Boeing provider,” as the company works through the launch abort engine anomaly. When NASA awarded Boeing and SpaceX their commercial crew contracts in late 2016, agency and contractor officials expected to have the new vehicles certified for regular crew rotation missions to and from the International Space Station by the end of 2017. But technical hurdles and several redesigns of the spacecraft have delayed Boeing and SpaceX’s first unscrewed orbital test flights until later this year, at the earliest. “These development programs are hard, especially for human spaceflight vehicles, where you really work to drive in robustness, redundancy, and optimize mass and volume,” Mulholland said Wednesday. “We laid out a very challenging and aggressive schedule, and we have had several slips in that plan based on the challenges that hit us in a number of these integrated tests, and through the design and development process. “That said, our commitment hasn’t wavered to make sure that we do everything that we laid out to do in our plan, which will ensure that when we fly we’re going fly with the utmost safety and mission success,” he said.